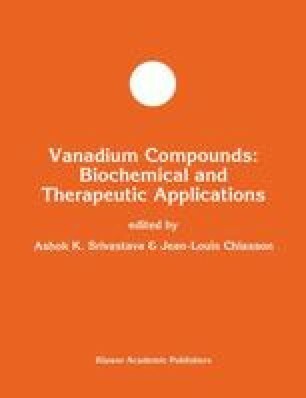 Peroxovanadium compounds, each containing an oxo ligand, one or two peroxo anions, and an ancillary ligand in the inner coordination sphere of vanadium, were synthesized, crystallized and characterized by 51V NMR as > 95% pure. They markedly decreased plasma glucose in insulin-deprived diabetic BB rats, with a nadir occurring between 60 and 100 min after intravenous, intraperitoneal or subcutaneous administration. Plasma glucose was reduced after oral administration in insulin-treated and in insulin-deprived BB rats. When compared to sodium orthovanadate, peroxovanadium compounds exhibited a markedly greater potency on a molar basis, and in relation to their toxicity. The in vivo potency can be predicted by the degree of phosphotyrosine phosphatase inhibition observed in vitro. These are the first agents other than insulin that can acutely and markedly reduce plasma glucose in hypoinsulinemic diabetic BB rats.